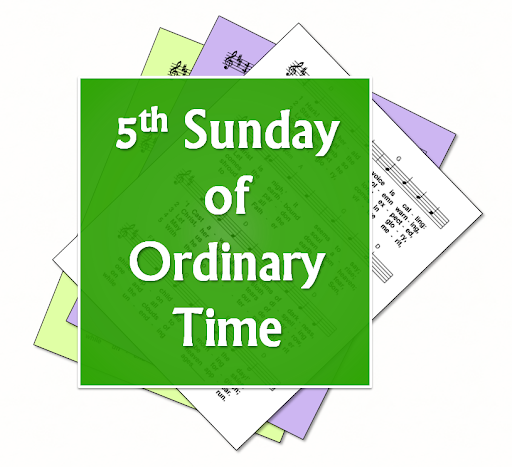 A selection of hymns and song suggestions, based on themes from the Roman Catholic lectionary for the fifth Sunday of Ordinary Time, Year A. A small selection of copyright hymns may also be included if they are particularly appropriate. First: Isaiah - Share your bread with the hungry, shelter the homeless poor ... your integrity will go before you ... cry and the Lord will answer ... your light will rise in the darkness. Psalm 111 - The good man is a light in the darkness for the upright / The just man will never waver / With a steadfast heart he will no fear. Second: I Corinthians - I came to tell you what God had guaranteed ... the only knowledge I claimed to have was about Jesus, and only about him as the crucified Christ. ... And I did this so your faith should not depend on human philosophy but on the power of God. Gospel: Matthew - You are the salt of the earth. But if salt becomes tasteless, what can make it salty again? ... You are the light of the world: no one lights a lamp to put it under a tub, they put it on a lampstand to shine for all the household. Your light must shine in the sight of all. Christ our light - an the light of the earth. The church as light in the darkness.